Often, a child can have a serious vision problem without vocalizing any complaints. The goal of school vision screenings is to detect these vision problems at an early age before they have a chance to develop and pose a threat to the child’s lifelong eyesight. Matti Lann is one of these children; thankfully, her hyperopia was detected and her vision is now improving. 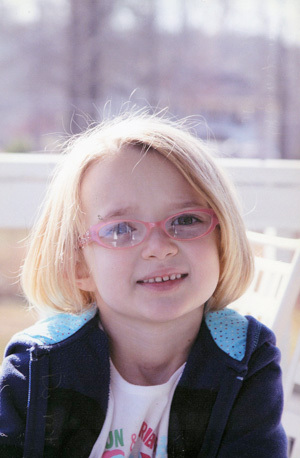 When Matti was taken to her eye doctor, Dr. Cagle, after her mother reviewed the results of her school vision screening, the vision in both of her eyes was tested. Her right eye was perfect; however, when it was covered up, she could not see below the large letter “E” on the eye chart. Dr. Cagle explained that the probable reason Matti had not complained was because her right eye was compensating for the left. If this problem had gone on untreated, Matti almost certainly would have developed ambyopia. Dr. Cagle commented that school vision screenings are a tremendous help for ophthalmologists, since many problems (such as Matti’s) are not apparent. Matti received a prescription for glasses, and she is doing very well with them. Although Matti has never had much trouble in school due to the fact that her good eye was compensating, her teacher has commented that her handwriting has improved a great deal. Matti never wants to take her glasses off, and she thinks that she looks “gorgeous” in them. She loves reading and drawing, both of which are much easier to do with her new glasses. She is also extremely active in her 4H club, and enjoys participating in its meetings and activities.